I’m sure some of you are aware that Sephora has stared their own subscription service. I’ve even seen some of your pics of the box. While I jealously loved your posts, I was wait listed months ago. I finally received the email that I was off the wait list!! Anyone else familiar with Sephora Play? How do you like it so far? I heard a about in August through a blogger and I immediately signed up so it took 9 months to get off that wait list. 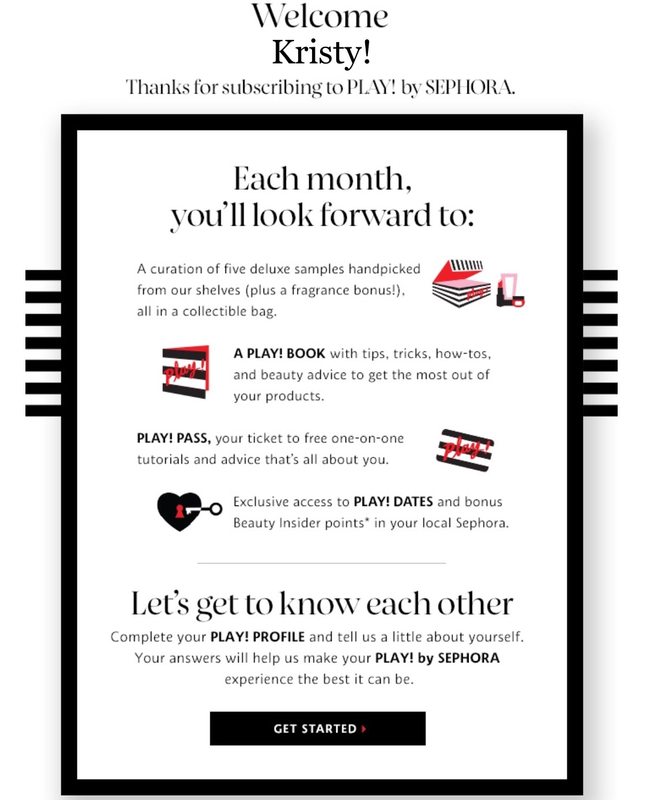 Here is the link http://m.sephora.com/play you can add your email and maybe, now that they’ve had time to roll this out, the wait won’t be so long. No problem. I hope it’s much quicker for you. It could be the area I’m in? Not sure. That was an email welcoming me after I signed up but I can’t see my info unless I log in to Sephora. I haven’t heard a word since and I would die too. Lol. What happened with Allure?? Well they released spoilers for their May box, so a lot of people were interested and signed up. Everyone that had signed up was supposed to get the May box since that is what they stated on their website. Just a day ago someone called to confirm their order and found out they wouldn’t be getting May’s but instead June’s. So they posted on this blog site about sub boxes.. and more and more people checked their accounts and they were now told they were getting June and not May. So basically anyone who signed up in April (regardless if it was before spoilers,) won’t be getting the advertised May box even though they were charged for it. Plus Allure didn’t notify anyone. People who found out through this blog had to call and confirm it. So not only did they charge hundreds of people, they neglected to tell everyone that they weren’t getting what they paid for. I’m sure a lot of people still don’t even know, and probably won’t know until their box doesn’t show up. It’s crazy sketchy and this isn’t the first time they’ve messed up big time apparently. Wow. That’s bait & switch. I’m so glad you told me! I almost ordered allure once based on spoilers but I saw that that month was sold out so I backed out…thank god. Very true!! If I see bad reviews on a company’s customer service, I stay away. Agreed it’s bad business! Just like me 😂 you are the only reason I know about it!! Thanks for the heads up!